Remember this house? 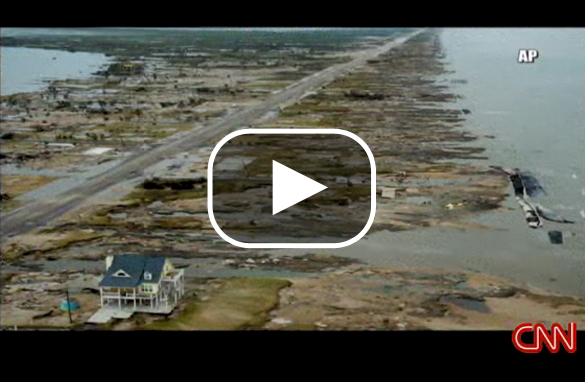 It was the only beachfront house standing in Gilchrist, Texas after Hurricane Ike. They still don't have power, but that didn't stop the owner, Pam Adams, from sprucing it up for the holidays. 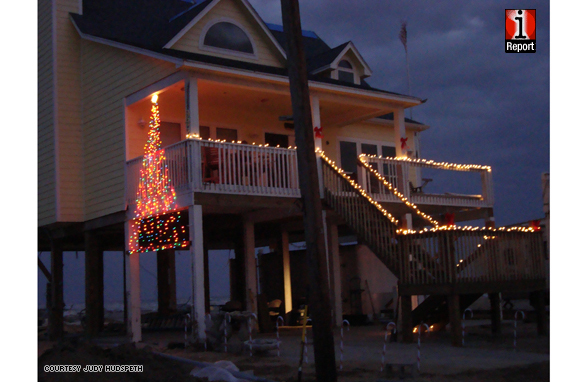 Pam's sister, Judy Hudspeth, sent in this picture of the house decorated with generator-powered Christmas lights and a tree. See more pictures of the house and other iReports at iReport.com. 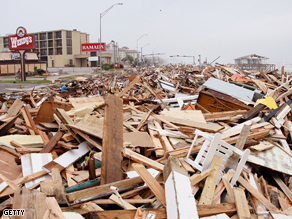 It is has been three weeks since Hurricane Ike blew ashore on Galveston Island bringing up to 20 feet of Gulf waters over the low-lying land, killing a still yet to be determined number of residents — several hundred remain missing — and inflicting billions of dollars in damage. The television satellite trucks and cable news stars are gone and the nation's collective eye has turned elsewhere. But thousands of area residents now live in a stench-filled world where the incongruous is normal and the dangerous real. The slow descent into the Looking Glass land that hurricanes create begins just south of Houston along Interstate Highway 45, the road to Galveston Island. The first odd note is the number of blown out billboards and signs. The gold has gone from the Golden Arches, the toll-free phone number on the billboard for the class action law firm has been torn and tossed to the wind. Then the blue tarps begin to appear, stretched taut over the rooftops of strip malls and apartment buildings. Ron Paul against hurricane recovery $$ for his district? "Dr. No" really lived up to his nickname this time. 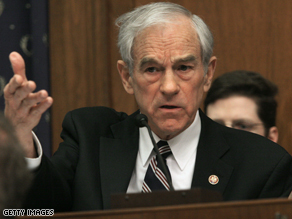 If you've never heard of "Dr. No" that would be Congressman and former presidential candidate Ron Paul. He's made a name for himself for voting against virtually every piece of legislation that he sees as government overreaching. Could you ever imagine finding a politician voting against sending billions of dollars to his own district to help recover from a hurricane disaster? I guess you can say Ron Paul is dishing out some tough love in the aftermath of Hurricane Ike. Paul's southeast Texas congressional district includes many areas hit hard by the hurricane, including Galveston Island. The Texas Representative voted against a $22-billion aid package to help in the recovery and rebuilding of the southeast Texas region. The bill passed despite Paul's opposition. But needless to say, some in Galveston are dismayed. "That's bad. That's sad," Galveston City Manager Steve LeBlanc told the Houston Chronicle. The congressman's office told me that Paul voted against the bill because "it was snuck into a bill he couldn't support." But his office did say he voted for a disaster tax relief bill that will help his constituents get back on their feet. Something tells me that's not what many voters in Galveston are going to remember. 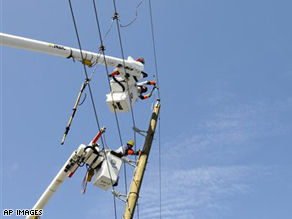 Florida Light and Power Co. linemen work to restore power in the Houston area. Susan Wood feels like she’s the victim of a cruel practical joke. Her next door neighbor’s power, in the Houston suburb of Bellaire, has been restored. All her neighbors across the street have power. Even the family that lives behind her has power. But Susan Wood sits in the dark waiting for the lights, and air conditioning, to turn on. About 500,000 people across the Houston region are still without electrical power nearly two weeks after Hurricane Ike struck the southeast Texas coast. 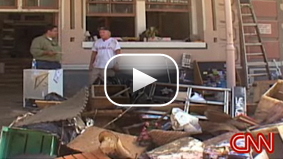 Galveston business owners worry the financial crisis will slow efforts to rebuild after Ike. CNN's Ed Lavandera reports. "It's never a good time to ask for money." Those were the rather understated words of Jeff Sjostrom, the President of Galveston's Economic Development Partnership (Think of the partnership as the island's Chamber of Commerce), when I asked him if he was worried that Texas officials were asking Congress for more than $11-billion on the same day the $700-billion bailout was being negotiated on Capitol Hill. 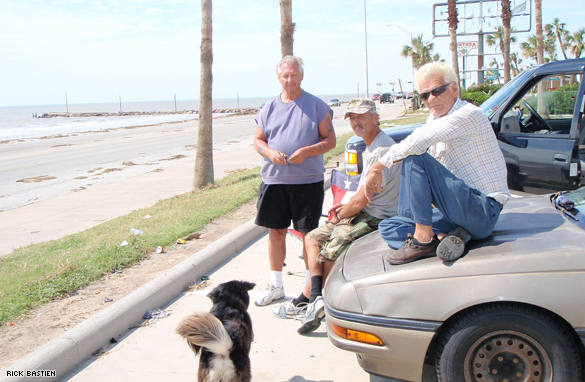 As hundreds of residents returned to Galveston Island to clean up it dawned on me that most of these residents have been so overwhelmed with the aftermath of Hurricane Ike that they'd probably heard very little about the collapsing financial markets. As I walked the downtown Galveston area known as "The Strand," most small business owners had barely heard any of this news. Who can blame them really? If you're not sure your business will survive or your home is in ruins you probably don't really care to read other depressing news. But there is concern among the small business owners in The Strand that the struggling economy will slow down the rebuilding in Galveston. "This is insult to injury here," Garry Depringre, the owner of Surf Styles told me. "We're going to need some help. We have to have help man. I can't do this on my own." The downtown tourist businesses were hard hit. Most stores took on 8 feet of floodwater. Tourism makes up about a third of the island's economy. So it's crucial for these tourists to come back soon. But if economy is struggling will they return? Another area of concern is the wiped-out and pricey beach homes on the west side of Galveston Island and Bolivar Peninsula. These are areas that make up about 45% of the island's tax base. But there are several hundred homes that might not be rebuilt. What kind of impact will that have on the island's economy? But island officials, like Jeff Sjostrom, say they're confident the economy will bounce back better than ever. I guess after a double whammy strike like Hurricane Ike and a financial collapse it's good to have people around who see the silver lining. The last house standing..."It's my sister's"
Yesterday, we received an amazing submission from iReport.com user 'austinheli.' His photos showed a lone house standing in a wasteland left in Ike's aftermath. We contacted austinheli, who is Ray Asgar, a private helicopter pilot based in Austin, Texas. He visited Gilchrist and Galveston Monday to photograph the damage left after Hurricane Ike slammed the coastal area last weekend. The lone yellow house caught Asgar's attention. He said it was the only structure standing for miles. Considering the extent of Ike's devastation, he said, it was "odd to have nearly any damage to one home." Several users left comments on Asgar's iReport, joining a debate about whether or not his photos were real. One user who jumped in was Kelley1. "This is my sister's house. It is real," she wrote. Shortly afterward, Kelley1 uploaded a photo of the yellow house that was taken in May. Kelley1 is Judy Hudspeth and the house belongs to her sister, Pam Adams. Up for the assignment? Go to iReport.com to submit your iReports! 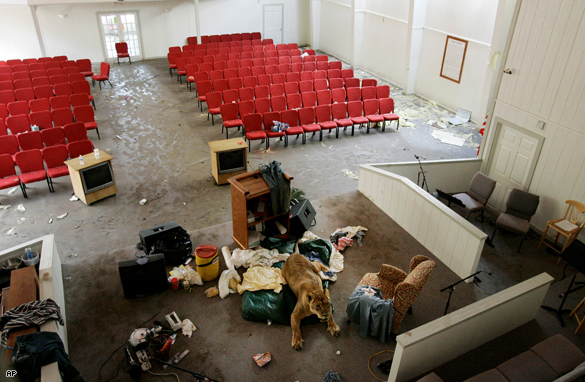 After Ike: Baptist Church now a Lion's Den? But of all the stories we heard during the storm, and all the images we have seen, there was one tale that I heard which I could not believe until I saw proof. 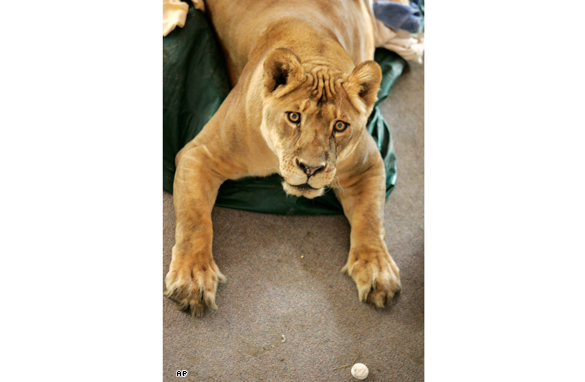 Meet Shackle, an 11-year-old African lioness as she lays on the altar at the First Baptist Church in Crystal Beach, Texas. The lion and her owner (who collects exotic animals) waded through Hurricane Ike flood waters to the church after they were unable to make it off Bolivar Peninsula prior to Ike's landfall. Chuck Jones, who led a task force that landed on the peninsula east of Galveston put it best when he said "We're not going in there... We know where he [the lion] is on the food chain." A few weeks ago, I blogged about stopping by Mr. Herbert Gettridge’s house to check on him after Hurricane Gustav passed through New Orleans. Well, I finally got through to him today, and he said he made it through with little to no damage. He had evacuated to Baton Rouge and said he should’ve stayed home since it was worse up there. In the years since Katrina, he’s been able to have his wife move home, as well as having children and grandchildren come and stay in their home. He told me that he’s finally getting neighbors again and he looks forward to having more. He also wanted to let you all know that he appreciates your prayers and thoughts of concern. He is New Orleans, and plans to be there for a long time to come. 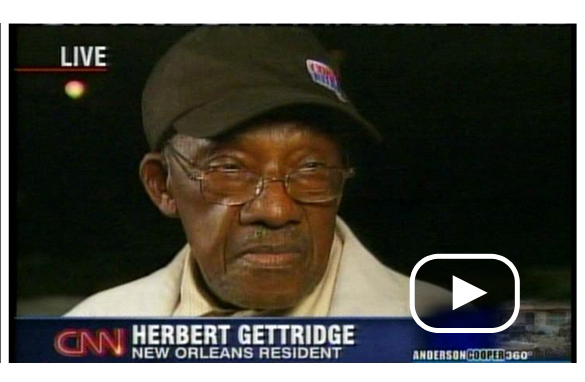 Back in January, we talked to New Orleans resident Herbert Gettridge about the struggle to rebuild a city. I found Nanc (pronounced 'Nance') on the Galveston seawall, walking her guard dog on the sunny Monday morning after the storm. “Be careful,” she warned, “he ain’t too friendly.” Nanc showed me her truck, where she keeps piles of blankets, biology books, and a mess of other unique items she has collected. Nanc didn’t tell me she was homeless, but she said she lives in her truck. 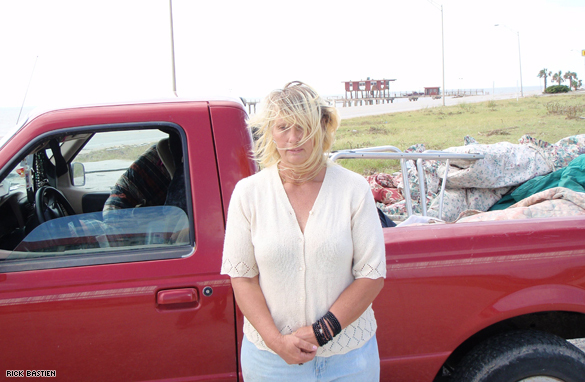 She also stayed in her truck in one of the most dangerous locations to be during a hurricane—across the street from the Galveston seawall. Why didn’t she leave? Because she had no money and no where to go and no gas to get there. Nanc is currently a Waffle House waitress, but says she wants to go back to school at UTMB, University of Texas Medical Branch. She was eagerly awaiting payday the week that Ike was swirling in the Gulf of Mexico. During the storm she says “it turned completely black, you couldn’t see five feet in front of you.” But Nanc still braved the elements and even left her truck during the storm because she heard a car honking and went to check to see if anyone needed help. She wasn’t injured and her car avoided the flood waters; Nanc says she is ‘waiting for school to start’ now that the storm has passed. Down the road from where I met Nanc sat three older men in a grocery store parking lot. Larry McCrea and his friends Tim and Mike couldn’t tell me much about their homes or where exactly they were from, but the also didn’t tell me they were homeless—maybe they are just ‘home-free,’ the same way Splenda is sugarfree. Larry told me he was a minister, but worked for no church. But he also acknowledged the suffering going on around him, and he asked for both God and the government to step in and make the lives better for the people of Galveston. I was in Smith Point, Texas, an area populated by more cattle then people. Cattle were roaming the streets like lost kids and some fell victim to Ike. 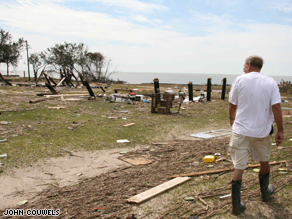 At the southern end of the point near the entrance to Galveston Bay, at little community the residents call "Bay Town," several homes were completely destroyed.